FARC/ELN and the Colombian government and other outside natural resource producing companies is really about the distribution and ownership of land in Colombia. In the 16th and 17th centuries in North America, the British quickly began to grant ownership of parcels of land to everyone from the wealthy who owned large tracts of land down to local farmers who took personal ownership of property that they could sell or pass down to future generations. At the same time in countries like Colombia (then part of Spanishcontrolled New Granada), the country of Spain was primarily interested in extracting whatever valuable resources they could from the land and exporting it back to Europe, and they saw the people of Latin America as slaves to be used in that work. The Spanish approach to land distribution in Latin American led to the land being held in the hands of tiny groups of elites as determined by the Spanish crown which laid the groundwork for the conditions that still exist in Colombia today. FARC and ELNâ&#x20AC;&#x2122;s development were a direct reaction to the people of Colombia being taken advantage of at first by Spain, but even later by Columbian elites that lingered on after the country had been liberated from the Spanish in 1819 (Demir, 2018). It was the Communist groups FARC and ELN that pushed back against elites in Colombia that had held onto their land since the time of Spanish rule by taking control of that land to allow peasants to grow crops, raise cattle, and have a piece of land that they controlled. Indigenous groups gaining control of land they had lived on for years was a major part of the 2016 Colombian peace agreement, but with FARCâ&#x20AC;&#x2122;s pull-back the indigenous peoples lost some of their protection which opened some parts of Colombia to private paramilitary groups who often work for people connected to oil companies and other outsiders looking to extract natural resources and drugs off the land (Klein, 2017). The Spanish conquest of Latin America and itâ&#x20AC;&#x2122;s focus on resource extraction from the continent set the long-term direction for the entire region and Colombia is but a microcosm of how land in Latin America today is often controlled by elites and others that do not live on or work the land. With the rise in the price of commodities in the 21st century what is above the land, coca plants, and below the land, large amounts of oil and gas, generates lots of revenue for the owners of the land and that stream of money that is generally not going to locals who live on the land has driven much of the conflict in Colombia. In addition to the historical reasons why local peoples have not had control of the land they have lived on for generations there are three other factors that add to the historical problems that have led to conflicts (Lavaux, 2006): 1. 2. the presence of neighboring countries considered to be sources of destabilization and distrust 3.
in the Putumayo region of Colombia which has a long history of growing coca to make cocaine for export (Leech, 2007), and today is a rapidly growing area for oil and gas production. The Putumayo department of Colombia rests in the Amazon basin in the southwest part of the country and shares a long border with Ecuador and Peru along the eastern flank of the Andes mountains. long-simmering issues of inequality and environmental damage to areas where natural resource companies and those cultivating coca for cocaine still exist. Locals do now have a say in whether natural resource companies will have the right to extract gas and oil off their lands which has led to number of new conflicts as people in the region weigh the benefits of new jobs against the potential for environmental destruction. Often the choice for people in the Putumayo region is to work for groups cultivating the coca plants or work with multinational companies extracting oil and gas that in some communities are taking on many of the roles that a government would normally play such as building infrastructure, funding schools and supporting local institutions (Tate, 2018). The 2018 Colombian Presidential election saw Ivan Duque, the conservative protégé of former President Alvaro Uribe, elected to the Presidency and now serving a four-year term that began in early August 2018. Duque has been critical of some parts of the 2016 peace agreement with FARC/ELN and the Colombian government and has promised changes in the agreement such as requiring former rebels to admit their wrongdoing before they assume political office. Duque defeated Humane Movement party member Gustavo Petro in a second-round runoff with Petro running on a leftist progressive platform that was developed over time as Petro moved from M-19 rebel leader in his youth, to member of the Colombian House of Representatives, to a contentious time as mayor of Bogota which included removal and then reinstatement to the position. Gustavo Petro vehemently opposed the policies of former Colombia President Alvaro Uribe which made for a contentious showdown against Uribe’s protégé Ivan Duque in the 2018 Presidential election which will continue forward as Petro will now return to the Colombian Senate (AP, 2018). have lived on the land for centuries. Those issues make the political situation on the ground in Colombia little different than what many Western countries now face as a battle between public and private, the company and the individual, the land owner and the land user rage on which is fight that is as old as humans have fought each other over the available limited resources which stretches back to at least 80,000 years ago when human beings first emerged from Africa (Gugliotta, 2008). 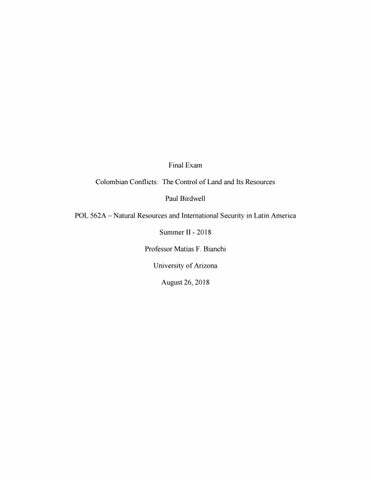 The direct connection between the control of natural resources and the armed conflict that flows from who controls the land and thus those resources (Lavaux, 2006) is even in the aftermath of the 2016 peace agreement between FARC/ELN and the Colombia government a defining reality of Colombia today which played itself out in the political debates around the 2018 Colombian Presidential election. In the last century, Latin American countries like Colombia have vacillated between right and left governments with progressive parties often gaining control through democratic elections and proclaiming their independence from the U.S. and other Western interests that have played a large role in the ups and downs of many countries in the region. During the post-World War II period, the U.S. CIA has been involved in overthrowing a number of leftist governments in Latin America (Talbot, 2016) that either nationalized the assets of American companies or impeded the ability of those companies to operate without governmental interference (Tablot, 2016). In more recent years Americans trained in U.S. police forces have moved into many Latin American countries like Colombia working with conservatively elected governments to tamp-down violence of rebel groups (Langguth, 2018), and possibly even to target social critics that speak out against the government (Baca & Jimenez, 2018). The Chilean poet and diplomat Pablo Neruda who lost his way in celebrating the rise of Communism and the victory of the people over capitalistic forces in the rise of the Soviet Union and China in the 20th century, and later recognized the evils of the likes of Lenin, Stalin and Mao (Feinstein, 2004) also recognized the evils that flow from humans love for money which in Latin America was exemplified by the pursuit of natural resources such as oil and gas. In his 1940 poem Standard Oil Company Neruda identified the essential issues that are still playing out across Latin America today as governments pursue economic development, often at the expense of the people and the environment (Neruda, 1940): Standard Oil Company, Pablo Neruda When the drill bored down toward the stony fissures and plunged its implacable intestine into the subterranean estates, and dead years, eyes of the ages, imprisoned plantsâ&#x20AC;&#x2122; roots and scaly systems became strata of water, fire shot up through the tubes transformed into cold liquid, in the customs house of the heights, issuing from its world of sinister depth, it encountered a pale engineer and a title deed. 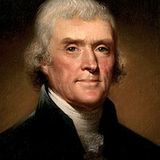 However entangled the petroleumâ&#x20AC;&#x2122;s arteries may be, however the layers may change their silent site and move their sovereignty amid the earthâ&#x20AC;&#x2122;s bowels, when the fountain gushes its paraffin foliage, Standard Oil arrived beforehand with its checks and it guns, with its governments and its prisoners. Their obese emperors from New York are suave smiling assassins who buy silk, nylon, cigars petty tyrants and dictators. They buy countries, people, seas, police, county councils, distant regions where the poor hoard their corn like misers their gold: Standard Oil awakens them, clothes them in uniforms, designates which brother is the enemy. the Paraguayan fights its war, and the Bolivian wastes away in the jungle with its machine gun. A President assassinated for a drop of petroleum, a million-acre mortgage, a swift execution on a morning mortal with light, petrified, a new prison camp for subversives, in Patagonia, a betrayal, scattered shots beneath a petroliferous moon, a subtle change of ministers in the capital, a whisper like an oil tide, and zap, youâ&#x20AC;&#x2122;ll see how Standard Oilâ&#x20AC;&#x2122;s letters shine above the clouds, above the seas, in your home, illuminating their dominions.â&#x20AC;? The leaders of Colombia and other Latin American countries need to find agreement with all people and groups that have a stake in the future of their countries at the point where “the attainable – the next best” is achieved because that is the point where the countries can move forward together while not leaving any behind, while protecting the environment, and while doing what it is never too late to do, which is doing what is right.